USA Roller Chain and Sprockets is a premier supplier of plastic power transmission components. 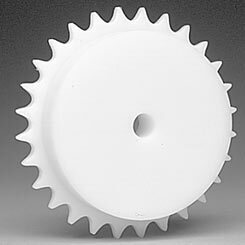 We have plastic sprockets available in ANSI sized #25 - #80 and in a UHMW, Nylatron, or Nylon material. Other materials such as Repro and Acetal can be used as well, and we can produce the plastic metric, double pitch, duplex, engineer class, and custom designed sprockets. Some of the main benefits of using a plastic roller chain sprocket are that they run quieter and produce a much better wear life on the roller chain. These sprockets are also highly anti-corrosive, extremely lightweight, have high impact resistance, and are FDA approved. Our plastic sprockets have a much greater tooth deflection than a standard steel sprocket does. This means that several teeth will bear the load of the roller chain. With several teeth in contact, this means that the load capacity of the sprocket will match approximately to the full working load of the chain. The standard styles of a plastic roller chain sprocket are A-plate style meaning that there is no hub on either side of the sprocket, B-hub style which has a hub on one side, and C-hub style which has a hub on two sides. Standard bore styles for plastic sprockets are a stock bore, which is a plain unfinished hole in the center of the sprockets. Finished bore, which is a certain bore size that includes a key-way and two stainless steel set screws. Idler sprocket, which we can supply bearing idler plastic sprockets, bronze bore idler sprockets or plain bore style, just advise the shaft size and we supply the bore with proper clearance to idle on the shaft. Besides plastic sprockets, we also can supply the accompanying plastic roller chain. We have ANSI sized 25 - 40 in acetal, Delrin, Kynar, Nylatron, and polypropylene materials. We also stock poly steel chain, which has polypropylene inside links and 304-stainless steel pin links.